Piano technique is by no means an easy element to teach and it’s even more tricky to learn and assimilate properly. Few tutors teach it successfully, whether this is because they know little about it or possibly because they find it difficult to relay to pupils (it is!). A good tutor must be able to break it all down thoroughly, building technique slowly over a period of time. They also need a compliant pupil who is prepared to practice and implement all the necessary ideas and physical movements. One of the most interesting elements regarding piano playing is comfort; how many students really feel comfortable and relaxed both physically and mentally when they play? Mental happiness usually stems from physical comfort and the satisfaction that arises from truly ‘knowing’ your piece. Physical comfort is something entirely different. Many students have ‘comfort’ issues which are apparent as soon as they sit down at the instrument. I have discussed posture and hand positions here on the blog several times (have a look here and here), but feeling ‘comfortable’ is a step further than merely sitting correctly at the instrument (although this is crucial). There are many who have an aversion to pianists moving around abundantly, perhaps rolling their head (and sometimes their eyes too!) whilst playing, but movement at the piano is vital. One of the most basic mistakes to make as a pianist is to stay in one position; how do you propose to get from one end of the keyboard to the other without moving swiftly and without any tension? The keys don’t come to you, but rather you must go and find them. This requires movement. Constant movement, from arms, wrists and hands generally indicates a relaxed torso and usually a relaxed mind too. Creating this scenario whilst playing can be very taxing indeed, especially if you have a fairly stiff torso and despise moving. When you are tense, you will automatically feel uncomfortable and this will usually reflect in your playing; it will certainly affect sound production too. I should add here that movement must always feel and look natural; I’m not suggesting extraneous movements or facial expressions at all, but merely ask pianists to play easily using tension only when necessary i.e. actually to play a note. Here are a few tips for creating flexibility and movement when sitting at the instrument. Nothing can compare with or replace proper and regular teaching, but start by thinking for yourself about how best to ‘free’ your body and move in a natural painless manner. Get acquainted with your comfort level. One way of ‘checking’ your posture and movements is by using a mirror; apparently, the great pianist Claudio Arrau often did this to ascertain which muscles were being employed when he played. You might be shocked at how frequently parts of your upper body ‘tense up’ as you play; this can be a most useful exercise. 1. In order to move effectively always try to sit up straight before you start practising and keep that way during practice sessions! Slouching is not conducive to comfortable piano posture. The feet should be flat on the floor, firmly supporting the torso. 2. When sitting at the piano shoulders must be down and remain there. This is an issue many pianists have to deal with; one idea is to check your shoulders copiously as you practice, you might be surprised at just how regularly they rise. Correcting raised shoulders is the first step to moving freely. 3. Once the shoulders feel free, arms must also be totally relaxed, almost like a ‘dead weight’ by your side. Even when engaged to play, they must feel free and be able to move swiftly, supporting the wrists and hands. The merely act as a support and should act as a ‘lever’ allowing you eventually to use proper arm weight aiding a warm sound (more on arm weight in another post). 4. The wrists are the most complicated part of the body to ‘free’, this is because many students are taught to keep them in a rigid position or sometimes even a ‘high’ position. If you can develop a rotational (or a circular) motion when employing the wrists, this will make it almost impossible for them to ‘seize up’ and be rigid. This is why movement is so important, if employed correctly it will aid stiffness completely allowing total comfort when playing. Generally you will need a good teacher to help you here. 5. As the wrists move in a rotational way (normally involving imperceptible circular motions), so the hands will also move laterally and this will stop them ‘freezing’ rigidly too, allowing taxing florid passagework to be easily negotiated which in turn will stop anxiety. When learning to master this, make large movements to start with as this will only aid freedom. 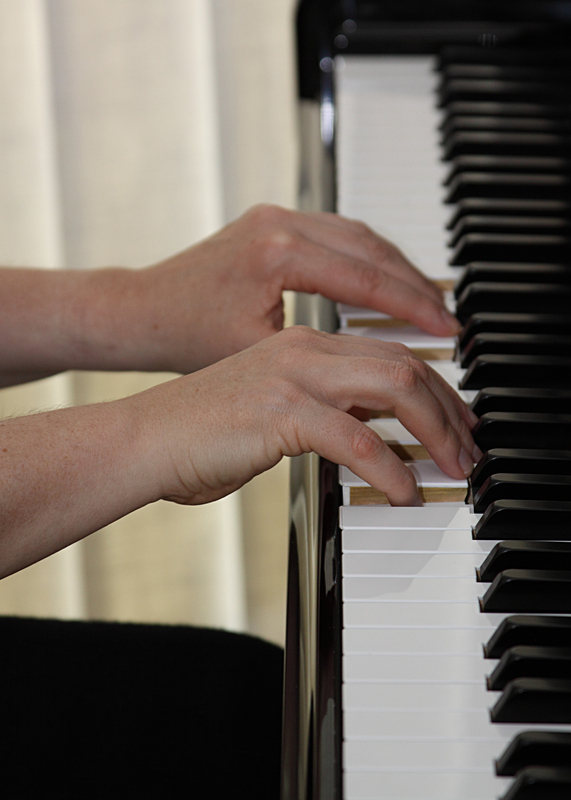 I normally encourage students to play single notes with each hand (separately) allowing a rotational wrist and hand motion for each note; the idea of tension and release seems to be easier to grasp this way. 6. The fingers are the only part of the piano ‘mechanism’ that really must not be too flexible. Fingers must work independently as I’ve mentioned many times before on this blog. That means without the ‘help’ or reliance of other fingers. They work best whilst being supported by the knuckles and by the whole arm, hand wrist mechanism. Finger strength will normally be built up in conjunction with freeing the upper torso over a period of time. This in turn encourages ‘comfortable’ playing. 7. You can test how comfortable you feel by observing how your body reacts to difficult passagework or sections of a piece; if you find it stiffens and feels tight, then this can be a good indicator of what you need to work on. Observing our body’s reaction is a factor that is often ignored when we practice, usually because we are so caught up in the music and its complexities. Try to develop a ‘sixth sense’ and be aware of your comfort level here. This is especially important if pain or repetitive strain has been a problem in the past. 8. Be conscious of using tension correctly. To play well tension must be employed, but as soon as a note has been struck, the finger, hand, wrist and arm must be ‘released’. This involves freeing the muscles used to play the note in the first place. So there will be many sequences involving tension and then release. Where some players come unstuck, is they can’t ‘release’ at the given moment; they stay rigid hence feel uncomfortable. You may be able to find ways of doing this as you practice, however this particular element usually requires a knowledgeable teacher, as mentioned above, to help release (and make you aware of releasing) certain muscles. 9. Be patient. This is one area of piano playing which is hard to amend; once the body is used to playing in a particular fashion, it won’t change easily. It will require tenacity, commitment and perseverance, but it IS possible. Easy movement and flexibility are imperative and fundamental to comfortable playing. I hope you are now acquainted with your comfort level, and will hopefully be able to start improving your body movement at the instrument – good luck. It’s always a pleasure reading or playing through new piano music publications, whether they be sheet music or text books, but The Magic Link is a piano book that encompasses both genres. 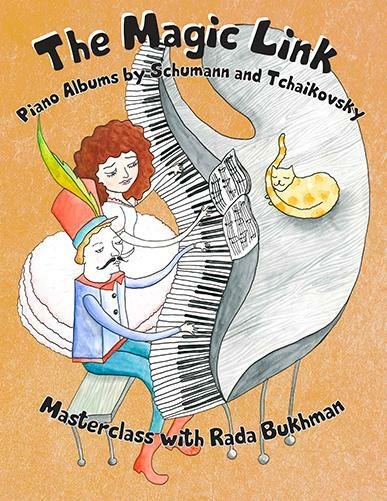 Russian pianist and educator, Rada Bukhman has designed a piano tutor with a twist, thus creating a completely different way to set about learning or assimilating classical piano music. Rada began her career as a pianist at the age of nine when she performed with the Omsk Symphony Orchestra, and has since devoted herself to teaching in her adopted home of Canada. She has written several books about piano playing, focusing largely on her alma mater, the Russian School. The Magic Link was written ostensibly for children; it contains the scores of Pyotr Ilyich Tchaikovsky’s Children’s Album Op. 39 (all 24 pieces) and Robert Schumann’s Album for the Young Op. 68 (18 selected pieces). These are important works for young pianists to tackle and they provide a varied foray into the Romantic repertoire. This book, however, affords far more than merely ‘notes on the page’; each piece is preceded, and in many cases succeeded too, by written conversations between a piano teacher and a few students. It has the effect of ‘eaves dropping’ on a class lesson, the teacher gently encouraging pupils to explore many diverse technical and musical issues in each work. A plethora of different topics are discussed, from Folk Tunes and Wooden Horses to An Italian Journey and Fairy Tales. At each point an appropriate work is presented often appearing with excerpts of orchestral or other genre works too, illustrating where each composer drew his inspiration. The piano teacher cleverly guides the young pupils through the pieces, pointing out various features from dynamic and stylistic markings, key signatures, and chord progressions, to different moods, character and how to make the piano ‘sing’, rather like a musical analysis. The teacher also proffers various stories regarding the lives of Tchaikovsky and Schumann giving tidbits of daily life which brings the whole experience to life. There is much information to grasp and a child might take some time to digest it fully, but with the help of a skilled teacher or parent, they will no doubt enjoy this musical adventure. Each piece is complimented with a colourful drawing, many sketched by children and some by Rada herself. One of the more interesting elements in this publication is the way particular musical styles are highlighted. From chorales and contrapuntal compositions to waltzes, polkas and Russian folk dances, young players receive an excellent introduction to various musical forms which is most helpful and instructive. This book will be a welcome addition to a piano library and a useful resource for any music teacher or parent who wishes to gain an insight into classical piano music therefore enabling them to help their children learn productively. The pieces are generally intermediate level, although beginners will certainly appreciate the stories, drawings and musical information offered throughout this volume. You can find out more information and purchase The Magic Link here. The twenty-fourth interview in my Classical Conversations Series features Australian pianist and esteemed teacher, Ruth Nye. I caught up with Ruth a few weeks ago and we chatted at Jaques Samuel Pianos in London. Ruth was invited to study in New York with Claudio Arrau after the Maestro heard her perform in Melbourne, Australia. A close personal and musical relationship developed which included accompanying him on countless tours around the world and lasted until his death some 30 years later. After her work with Arrau in the United States she made London her home and a full international performing career followed which included six Queen Elizabeth Hall, and five Wigmore Hall performances. Ruth has taught at the Yehudi Menuhin School for over twelve years and is also a member of the Keyboard Faculty at the Royal College of Music. She is in demand to conduct masterclasses in countries around the world and frequently adjudicates on international competition panels. In recent years her pupils have received The Chappell Medal at both the Royal Academy of Music (where Ruth was formerly on staff) and the Royal College of Music, won the concerto competition multiple times at the Royal College of Music, won places in the Junior Tchaikovsky Competition, Japan and the Bechstein competition, Berlin, won a solo Wigmore Hall recital (2005) and places in the keyboard finals of the BBC Young Musician of the Year (2005). MELANIE SPANSWICK: Australian concert pianist and esteemed teacher, Ruth Nye has performed extensively. Her students have won both national and international competitions. And, she studied with Maestro Claudio Arrau with whom she became a close personal friend. So, I’m really excited that she’s joining me here today at Jack Samuel Pianos in London for a Classical Conversation. Welcome. RUTH NYE: Thank you very much. MELANIE SPANSWICK: Lovely to be here chatting to you. RUTH NYE: Thank you Melanie. MELANIE SPANSWICK: I am going to start by asking you what about your musical education? How old are you when you started? What was the catalyst? Did you come from a musical family? RUTH NYE …talented, he was delighted. MELANIE SPANSWICK: I’ve heard that before actually. People just playing their scales whilst reading! RUTH NYE: Don’t tell the students. RUTH NYE: But I’d been certain place in the book that I didn’t want to let it down and as long the piano was going I thought I was safe!… Anyway, but it was… it was a very good background to have come from and it started with a wonderful…. this was in Brisbane, Australia which is not a very big city. It was the capital… it’s the capital of Queensland. It didn’t have a conservatoire but we did have this wonderful teacher. I mean, she was meticulous, not… with some sense of humour, but she was determined that she would teach us as well as she could and she not only taught us to play…. she did teach us all the theoretical background. MELANIE SPANSWICK: Which is so important. RUTH NYE: –until… until when we were both in our 30’s when we actually did perform the Mozart Two Piano Concerto. After it was over, my brother Ronald said to me, ‘you know, the first performance of that was given by Wolfgang and Nannerl and I wonder how many other brothers and sisters have played it’. RUTH NYE: combinations of brothers and sisters. RUTH NYE: But we didn’t research it I’m afraid so we don’t know. MELANIE SPANSWICK: So, you didn’t know? RUTH NYE: So, we were… we were very fortunate. And fortunate in many ways in Australia too because it’s… we got a lot of, lot of opportunities to perform. MELANIE SPANSWICK: Yes. I can imagine. RUTH NYE: Whereas, here, it’s a much bigger population, much more drive in the arts than when we were children and Australia’s … much stronger now of course. RUTH NYE: But we did because we were good we got a lot of opportunities which you can’t…I will say to the youngsters nowadays, you know, you can’t just sort of say, I’ll buy that when you’re twenty. If you had that… If you had this experience behind you, it’s like, you’re putting something in a safe deposit in a bank and it’s all experience that you cannot buy later on. MELANIE SPANSWICK: So, do you feel competitions are very important? That was one of my questions. Do you think they can … Can they establish a career, even today because we have so many of them, don’t we? RUTH NYE: We do. We’re swamped. MELANIE SPANSWICK: I don’t know… I read there was 350 last year and that’s professional ones you know. I mean, does … does it mean anything at all? RUTH NYE: I’m… I’m not… I don’t keep up with them. From that point of view, I’m not a good teacher. I’m not one of those teachers saying, ‘this is coming up, you must go for it’. They come to me and say, can I do this? Occasionally, I will say I think you should do it. I think when we were young; it was… it was a much more gentle atmosphere. It wasn’t so cut-throat. I know that when people, perhaps particularly parents, saw our names on the list they say ‘oh God’, because we would usually win but… but it wasn’t… it wasn’t anything that was… you… you felt that you will be belittling somebody that didn’t win. It is much quieter, calmer, I think. Even the big competitions in Australia were…were gentler somehow I felt. But, I think, throughout, a lot about the whole work because it would have been a handful of really, really big—like the Geneva one…..
RUTH NYE: — ones you know, the sort of thing but well, after the war, Second World War, I think and then they sprang up like mushrooms, didn’t they? I call them a mixed blessing. I think… I think to get the experience of doing them is good for the students as long as they don’t fall down when they get knocked out in the first round. RUTH NYE: You get the philosophy that if you’re knocked out, you’re knocked out. You get on with it. The danger of them… I think there are many dangers. One is that the youngsters carry the same repertoire for too long because they feel they’ve got a good competition repertoire and they’d go from one to the other playing same thing, so mostly they ask for much the same things, works to play, repertoire. RUTH NYE: So, that’s… that’s one danger. So, they are not pushing their horizons with their own repertoire enough, nearly enough. And the other danger is of course, that if they do win, sometimes they’re not equipped to carry off the prize which is a lot of playing. MELANIE SPANSWICK: A lot of concerts, different repertoire. RUTH NYE: Different repertoire. And they’ll be asked to play a concerto, that they have to learn, in four months time somewhere and of course, even as they say yes, but big concertos need more than four months to gel. MELANIE SPANSWICK: Yes. That’s right. RUTH NYE: To mature inside you, which has to work. So, they’re dangers but if… but if… I mean, they are with us. We can’t ignore them. RUTH NYE: So, we… we have to… we have to take the good side and I hope that we can… gentle, as they take about horses! So the student is not to get upset if they’re knocked out. MELANIE SPANSWICK: Yeah. That’s true. RUTH NYE: And they often make great friendships because they all meet each other…..
MELANIE SPANSWICK: Yes, they must know each other very well…..
RUTH NYE: Yes. They do. Yeah. Seriously, I… I… I am quite ambivalent about them. MELANIE SPANSWICK: Which teachers do you think were most influential in your life, especially when you were young? RUTH NYE: Well, I… I only had three teachers in my life. I mean, one can learn from going to to a performance of somebody’s and then think wow. And I know that John Lill said that the greatest teacher he ever had was Arrau even though he never had a lesson from him in his life. He was a great devotee of Arrau but he would go to all his concerts. RUTH NYE: So, that is possible you know, you do learn from performances. But, I was lucky that I didn’t… I didn’t have that sort of wandering search for a good teacher. They almost arrived in my lap. RUTH NYE: So, from… from Edna Hosking in Brisbane to Lindsay Biggins in Melbourne, who was I would say very different. Lindsay had a huge personality and was really wonderful at getting you prepared for performances. He had this innate sense that he mustn’t allow any tension… bad tension to spring in, but of course we need some tension, you won’t play a note if you don’t have some tension. You got to know how to get rid of it. So, that was good. So, nothing ever grew up, grew into us that had to be knocked out, but he… he had a flair. He was talented, no doubt about it. He was great. And then from then, to be offered from Arrau, to go out to study with him in the US. RUTH NYE: And that was… that was not a… How should I put it? Not a sort of volcanic change but it was… it was such a widening of my whole piano experience. MELANIE SPANSWICK: It must have been… that was my next question, it must have had a huge impact on your… on your playing. MELANIE SPANSWICK: And your career. RUTH NYE: Yes. Yes, it did. He did say to me when I first played to him… I was about twenty. He said, who taught… who taught you to play like that? I said, like what? What do you mean? You know, everything is organic. And so, I was really… I was quite natural. So, and of course he was delighted with that. So, it was… It was great. Because he was unique, you know. He was sent by the Chilean Government, the family was sent from… he was the age of five or six, six, it would have been, I think. He was playing concerts at five and… And the Chilean Government didn’t know what to do with him… they have this young genius on their hands. So, they… they paid for the whole family to go to Germany and that was the best scholarship they could offer him and fortunately in time, when he was about nine, he found the teacher called Martin Krause. Who was one of Liszt’s late students, and so this wonderful hereditary line we have is great. Goes from, through to Liszt, through to Czerny and through to Beethoven. RUTH NYE: It’s wonderful. We pride ourselves on it but we’re just lucky. But… So, Krauss was a father figure to Arrau. His father died when Arrau was two years old. But he… he was pretty tough to, you know, I think Arrau… they… they rented a house in the same street that Krause lived with his daughter. And Jenny Krause was a piano teacher too, and Arrau used to leave his house and go stay for the whole day while Krause was at the Stern Conservatoire teaching, he would practice there. And he would come home in the evening and work there, practising. It was really, really tough but… and he realized that Arrau played in… but he that said Arrau played like Liszt played. He said everything was natural at the keyboard. It was nothing that was restricted. The sound was fantastic. So, he left that alone but… but he certainly did insist that all the technical work was done absolutely a hundred and ten percent. So, I think he just realized that this boy knew it all. Now when Krause died, when Arrau was sixteen, which is a horrible time because he just almost got out of short pants into long pants, after being that child prodigy, then suddenly he having to be that ‘ultra’ performer and so it was devastating. He…. he died because of that awful flu epidemic that came after the First World War . And he… He was invited by so many people to go and study with ‘this one, that one and he said I don’t know where he got the strength because he was always quite a shy person, but he got the strength to say to all these people, no. No. MELANIE SPANSWICK: Especially at such a young age. RUTH NYE: Yes. And so then, he was by himself and he then thought ‘why is this sound I make different from a lot of pianists’ and so our good fortune is that he set mirrors up all around (a bit like in here) he… he just watched what he did. RUTH NYE: — with everything and so he was able to pass it on, because if he hadn’t done that, he wouldn’t have known what he did… so he wouldn’t have known how to teach it. RUTH NYE: So, that was from my point of view a wonderful thing, that was a pretty devastating couple of years for him. But his repertoire was unbelievable. I mean, he … he performed the whole Bach works, and I know you have met Angela Hewitt…. RUTH NYE: And she is wonderful. RUTH NYE: I’m sure she has performed most if not all of Bach. And… But he did a whole cycle of all Bach works in Berlin and… and he…he you know, he’s done so many of these, played all the Mozart sonatas, he just… he did all these chunks of huge repertoire, in his early years and it’s a… as an experience, I feel very privileged to be able to pass on to others. MELANIE SPANSWICK: Yes. I can imagine. What are your special memories of him? Do you have any? RUTH NYE: Special memories and lessons, let’s do the serious side first. I remember the first, the very first lesson in New York, when I was doing the Appassionata and when I played it, he was just sitting over there upright. He never used another piano when he taught and I’d go along with this because you don’t want them to copy you. RUTH NYE: You have to put it into words so that they can translate it and then do it, whereas, so many people play it and the students get an idea but they don’t find it for themselves, you’re not really teaching them anything. You’re teaching them to be monkeys – to copy. RUTH NYE: Anyway when I turned round and saw him the… and he started to speak in a gentle, quiet voice and not because I was unhappy but I was so overwhelmed that my eyes were filled with tears and they just rolled down my face for probably the whole lesson and he said, ‘oh dear, don’t. Have I distressed you?’ I said, ‘no, I’m happy’. So, anyway, I had a few tissues so it was alright. But… but his teaching was… always with words, he had a wonderful gift of, because at one stage he was fluent in five languages. I think couple of them got a bit rusty as he got older, but he could speak, because of his life, that’s what he could do. But he had this wonderful sense of being able put across with words what you then had to take in and make your own and bring out yourself. He never… He never said like this and played it, and that was… that was a rare, rare thing. It’s so… so often you see a teacher just… just play, you know. MELANIE SPANSWICK: Yes. Just sit and the piano. Just mimicking. RUTH NYE: Yeah. Yeah. I remember one person when I had this wonderful birthday, concert given to me at the Menuhin school last December and a musical friend came up after this, cause a lot of my students came back and played , and the whole concert was made up, and the Director of Music organized all. It was all a secret from me. I didn’t know what’s on the programme until I got there. RUTH NYE: But somebody came after the concert, amazing things are all different and I took that as a great compliment. RUTH NYE: I really did. They had all the same, what I call, philosophy of the way to play the piano. But you have to let the person run themselves musically and not just stamp your image. They’ve got to find their own way. MELANIE SPANSWICK: Sure. Sure. You’re… you’re a very celebrated teacher now, you teach at the Yehudi Menuhin School and the Royal College of Music. MELANIE SPANSWICK: What is it that you love about teaching so much? Because you’ve devoted a lot of your time to it. RUTH NYE: — in teaching. Fortunately, with a lot of…with an awful lot of talented people. So, I say to the… to my students when they start to teach, I say look at … when a little youngster coming to you, has to have one of two qualities, they have to be musical or they to be enchanting that you can’t resist them, you know. But… But that is true, you know. But, what I love about it is you get somebody who has musical gift there and has talent and that… that varies you know, you can find somebody who works at the piano and has no problems at all. You find someone who’s hand is perhaps not quite the right thing for the piano and you got to make it right. But what I love about it as much I think, most… two things that I do, I’m able to do, is to see a human being develop as a person because we’re developing the talent inside them. And if that talent wasn’t developed, I don’t say they would be a lesser person but they’ll be a different person and to see this growing so wonderfully with confidence and they’re prepared to express themselves that is… that is wonderful. And then of course the… from ability to do it. You have to teach them that as well. So, it’s very fulfilling. It’s… It’s… It’s wonderful when they find things for themselves to you know, say well, someone was playing and I said ‘ why… why did you want to do that accelerando there? It’s not marked.’ ‘well I just thought it would be, you know’, I just said…It’s not convincing. Play it again and convince me. If you convince me, you can do it. But play it again, and convince me. Nine times out of ten Melanie, they’ll play it again and then turn round to me and say, ‘ no, it didn’t work to… didn’t work.’ And that’s the best way because they find it out themselves. RUTH NYE: Whereas, if you just come and say, ‘don’t do it’. And they… Hmm… Hmmm..say ‘I want to do it’. RUTH NYE: But when they find out themselves, it doesn’t work. MELANIE SPANSWICK: Yes. What aspects of piano study are most important when you take a young… young pianist and you start training them? What do you think is the most important? RUTH NYE: I… I just got a new youngster…at the Menuhin School…a little boy and he’s incredibly musical. He’s nine years old, I think. And what I found that his theoretical knowledge is very patchy, even for a nine year old, it’s patchy. So, I… I… I, he’s had two weeks of school with me but already I’m starting to… to build that foundation to make sure there is no holes anywhere. 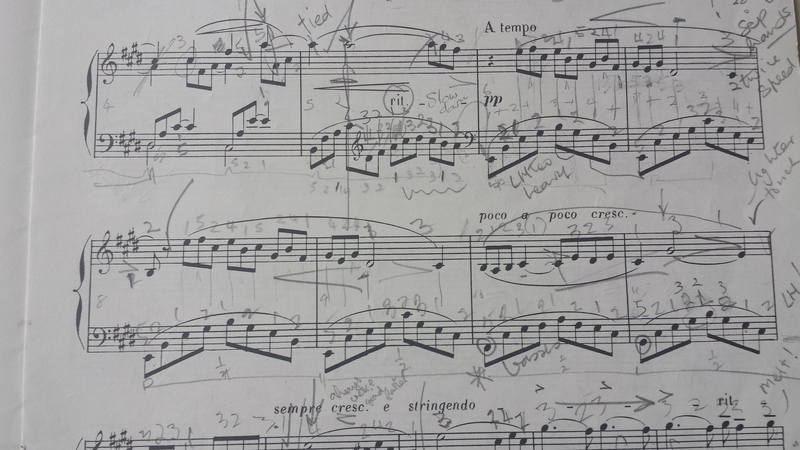 There comes a time when he… you know, if he doesn’t know that F sharp major has 6 sharps. RUTH NYE: He doesn’t know there the order of sharps and flats. RUTH NYE: Which he didn’t. RUTH NYE: It might sound trite but it’s important, you know. And the… all these foundations, these cornerstones, that we must make sure are in place and if you suddenly find there’s is a gap then you’ve got to fill it in, making it fun, making it an adventure. If it’s dry and boring, they get dry, they get bored. RUTH NYE: But if you make it an adventure and then they can see it then and they apply it to what they’re doing. What key are you playing in? Why have you got a B natural there? What’s happened? And make them think. RUTH NYE: Make them use their brains. So, that’s… that is very important. The other thing is you’ll find a lot of this business. And sometimes, it’s easy to break and other times it just takes a little time because it’s quite ingrained but just… you just gently keep pushing it down ‘cause that’s also puts awful tension through the whole body. If you’ve got a restriction anywhere, I feel that you cannot get the sound out of the instrument that you want, because you’re finally, no matter what you do, you finally just might get a pencil and go ‘bonk’. You need… You need to know what you want to do with your body to get that particular sound, ‘cause we are playing… we are playing a machine really. RUTH NYE: We’re not in, we’ve got an E. We’ve got all the mechanics that work inside but we can make that particular note sound different. One… One thing I find is that people only think of expression like, pianos and fortes or mezzo fortes, that sort of thing… and they think of them in decibels. They don’t think what type of mezzo forte that I am wanting to produce? RUTH NYE: And the range that is huge but… but how can we produce it? That… That range when you’re touching something, work something inside and I… it’s magic because if… if you have the image of sound in your head, and you just… use your body in the correct way, the sound will come through. If you don’t have the image, well then you’re lost. But you have got to have the image first and then it turn… it just… it happens and this is I think, was the… why Arrau said to himself, ‘why do I make a different sound?’ Not only a different sound, but a range of sound. Not in decibels but in that area of … of that one little string. If you… If you think of the world, you get it like in painting. RUTH NYE: You’ve got a beautiful pink jacket on , well there are a lots and lots and lots of sorts of different pinks jackets aren’t there? But it’s still a pink jacket? MELANIE SPANSWICK: That’s very true. MELANIE SPANSWICK: So, what does playing the piano and teaching the piano mean to you? RUTH NYE: I suppose it means a huge amount. I think I was very lucky when this thing happened to my finger that I was able to go into teaching. I think if it had been taken away from me completely. I think you’d be a different person. I don’t say you’d be a worse person or a better person, I think you’d be a different person. I don’t think you’d be the same person. I think I’m lucky that the other side of my life is good. I’m… I’m very lucky, I’ve got a wonderful family and so, it’s not that I would feel pushed out because I know I still have that behind me that’s solid… solid thing. And… But, I think if you take any artist or you take any art away from any person you… you must end up as a different person. RUTH NYE: And I’m sure I’m afraid although I love my garden, and I love my gardening, I’m afraid as every year I past the ground gets further away all the time. So, in as much as I could have spent hours and hours in the garden, I can’t now. So, I just have to enjoy… enjoy it a little… little… a little and often but not a long time. So, there are… I… I don’t think I’ve been miserable but I would be bereft. Yeah. RUTH NYE: It’s a pleasure. Thank you, Melanie. Piano Duets are amongst the most enjoyable of all chamber music, both for performers and listeners. All pianists, irrespective of standard, can benefit from getting together with a fellow player for some piano fun. They can also be very educational, because they are an excellent method of practising sight-reading. Reading will become so much quicker as pianists learn to keep the pulse (crucial in sight-reading), as hesitation is not an option when working with other musicians. They also provide the perfect opportunity to create music with another person as opposed to playing alone, which in itself encourages players to listen and become more aware of their own playing. Advanced players are able to explore some of the most beautiful music ever written for four hands, but less experienced players are not so fortunate, as pertinent and interesting material is more difficult to find. Delightfully Easy Piano Duets certainly fill a gap in this market. Designed for absolute beginners (as the title suggests! ), they are written by Rosamund Conrad, a piano teacher and music educator, who also noticed this apparent lack of suitable material for her students to play. Book 1 consists of ‘Eight piano duets in the five-finger position for beginners and intermediate players’. ‘Beginner’s parts can be played with both hands or just one’ advises Rosa. This will be of benefit to many very young players as well as more mature learners who are just getting to grips with reading notes and combining two hands. The Primo part (or top part) caters for the real beginners (or pupils) and the Secondo (or bass parts) are for teachers or slightly more advanced pianists. To this end they are very effective. After all, teachers often want to test students on reading ability in lessons as well as encourage them to have fun and enjoy music making. The Primo part bears the instruction to be played either one or two octaves higher, and each piece assumes a different character; from Pentatonic 3 (which must be swung) and Tempest to Breeze and Saloon Bar Blues. These bright, tuneful works will no doubt capture the young beginner’s imagination whilst supporting constant progress. The top part is generally in unison which makes for swifter reading, and bass parts consist of Alberti Bass figurations and chordal progressions, impressively swelling the sound. Rosa’s duet quest is ‘To inspire confidence in playing and reading music and to be enjoyed’ and she has successfully fulfilled this criteria. You can find out more information and where to buy this book here. Unless you have been on another planet, you will know there has been much baby talk this week, with the arrival of Prince George of Cambridge, the new royal baby. So I thought it may be appropriate to highlight the best ways to introduce a little child to making music. It’s entirely natural for young children to enjoy music and want to take part in musical activities, however, I believe the best age to commence formal piano lessons is around the age of seven or eight years old. This doesn’t mean small children can’t enjoy lots of different musical events or activities, and it’s extremely beneficial for their development too. 1. Rhythm is one of the most important elements to be grasped in music making. You can use very simple household items such as Rulers, Saucepans, Pots, Wooden Spoons etc. and ‘beat’ in time with the pulse to any type of music (pop and rock is good for this type of activity). It’s good fun and will urge a child to observe a basic pulse (the basis of elementary aural training or listening tests). Children love to get up and dance too, so all kinds of movement to the music can be encouraged. 2. Instruments can be formed by using bottles filled with various amounts of water (forming pitched ‘sounds’ if struck or blown), filling empty jars or containers with rice or any kind of dried beans (forming a ‘shaker’), or just using an upturned box as a drum! These could be supplemented with triangles, little bells or various percussion instruments encouraging children to explore different sounds and effects. 3. Familiarise your child with all styles of music; listen to everything from Classical to Folk and beyond. Music from various periods and cultures make this type of activity even more valuable. Children do not differentiate between styles, so this therefore is the ideal time to encourage them to enjoy all genres; a must for those who are keen for their little ones to fall in love with Classical music particularly. Introduction to various instruments can be done by listening to their respective sounds via recordings. 4. Singing is one of the most important elements in musical development. Simple tunes, nursery rhymes or hymns can provide the perfect foil for a child’s first vocal experiences. Be sure to assist by joining in and making sure children really listen to the tune so that they can try to pitch the sounds successfully. This can take a while but practice makes perfect in this respect. 5. Drawing pictures can fire a child’s imagination and creativity. Whether sketching various instruments (instrument colouring books can easily be obtained), or scribbling images of how a piece makes them ‘feel’; is it happy, sad, fast like a train, or slow like a snail!? This is a great idea for musical development later on too. 6. Pitching notes can be challenging for little ones to start with, so it can be a good idea to help them distinguish between high pitches or tones and low pitches; a variety instruments or even everyday sounds or noises can be the perfect foil here. It can be great fun exploring some of these ideas with children; I love helping my nephew and niece in this respect (who are aged five and two years), and it’s interesting observing their responses. If you implement some of these ideas, by the time your child starts instrumental lessons they will have already understood the basics.